Do you know why Superstar meets CM? Salman Khan is currently in Jammu and Kashmir and he has started shooting for his upcoming film Race 3. According to reports, Salman who was recently granted bail in the 1998 blackbuck poaching case by a Jodhpur Court reached Kashmir on Monday. Salman Khan is shooting for the final lap of the third installment of action-thriller Race, which is produced by Ramesh Taurani. The crew is currently shooting in the picturesque Sonamarg meadow in Ganderbal district in central Kashmir. Jacqueline Fernandez is also in Kashmir for the filming. 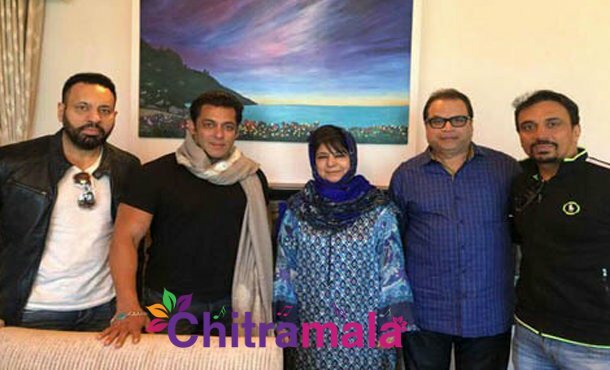 Salman and Taurani called on Chief Minister Mehbooba Mufti on Monday. While, the officials have been tight-lipped about the meeting, a picture of the meeting was shared by Taurani on his Twitter account. “We thank the Chief Minister Madam Mehbooba Mufti for welcoming us in Kashmir for the Final Lap of Race3 with Salman Khan,” he wrote on Twitter. Directed by Remo D’Souza, Race 3 also features Anil Kapoor, Bobby Deol, Daisy Shah and Saqib Saleem. The film is scheduled to be released on Eid this year.